Cleanly machined from hardened, steel bar stock to better resist the wear and tear caused by daily holster carry. U-notch cut eliminates the distracting bottom corners of traditional sights for fast alignment with fiber optic, tritium dot, and gold bead front sights of factory height. 40 lpi serrations on the blade face reduce glare in sunny conditions. Upper corners are machine chamfered to prevent snagging on holster or clothing. Centrally located setscrew secures sight in factory dovetail. Includes wrench and instructions. May require minor fitting. 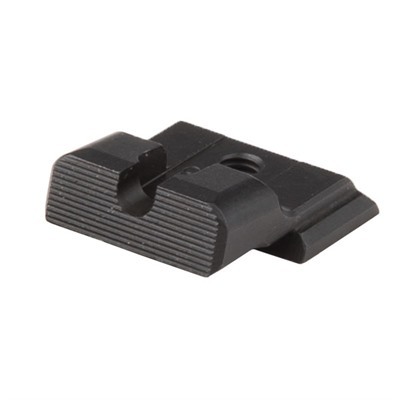 S&W M&P .140" U-Notch Rear Sight and S&W M&P .156" Wide U-Notch Rear Sight available. Mfg: 10-8 Performance Llc SPECS: Steel, black, matte, manganese phosphate finish. Body - .895" (2.3cm) long x .730" (1.9cm) wide. S&W M&P .140" U-Notch Rear Sight and S&W M&P .156" Wide U-Notch Rear Sight. Fits all calibers, sizes of Smith & Wesson M&P pistols.